KangenWaterIonizer: How Do I Use Kangen Water® For Beauty Care And Skin? Because winter air is extremely cold and dry, skin care is especially importantduring this time. Without taking care of your skin properly, you will suffer from dry and roughskin. Drinking alkaline Kangen Water® can help maintain glowing, smooth skin. During the winter, bathing in acidic water can help preserve the moisture ofyour skin. Acidic skin provides you protection against bacterial infections entering throughyour skin. Put your ionizer on the strong acid water setting and use this water as anantiseptic, skin tonic or cleaner. Strong acidic water has great disinfecting power and is often used byrestaurants to prevent food poisoning. This water is the strongest disinfectant of its kind! It's great for:For your Skin, Hair and Teeth - specific benefits include:Strong acidic water improves manyskin ailments such as Athlete's Foot.Shampooing: When using acidic ionizedwater before and after shampooing, it will not only protect your hair, but alsoprevent hair loss, itching, and dandruff. Hair care - use acidic water instead of a conditioning rinse. Bathing: Mix in 6-10 liters of acidic water to your tap water in your bath tub. Bathing in this water will improve the overall health and beauty of your skin. Bath water - acidic water will keep your tub free of rings while keeping yourskin radiant. 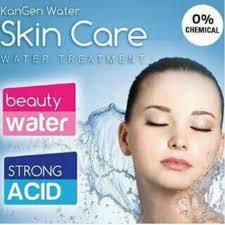 Eczema and Acne: Acidic ionized water is able to kill bacteria, to keep the skinclean and to improve your skin condition. Brushing Teeth: If you regularly use acidic water for brushing your teeth, it willhelp to maintain healthy teeth with whitening, sterilizing and disinfectingresults. Gargling: Gargling with acidic water prevents infection of germs by killing the microbes that cause colds and tonsillitis. other than skin care benefits with kangen water enagic. Kangen Water is the pronounce that Enagic, a Japanese company, that makes their proprietary water ionizer units to make a special water with special characteristics beneficial to human health in a long term through a process called electrolysis. The electrolysis is run in a state of art electrolysis chamber which contains electrodes made with quality precious metal Titanium and coated with pure Platinum. There are many such units out in the marketplace from japan, korea and taiwan. But the leader for ever is enagic kangen.